This post on Old Christmas was originally published in 2011. If you missed it the first time, here’s another look at the story behind this tradition, observed today in Amish communities. The Scotch-Irish Mountain folks up in Tennessee still call the 6th “Old Christmas”. Their tradition has it that one ought never lend anything to anybody on that day, for the lender will never get it back. 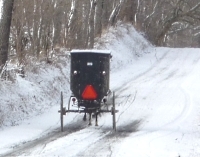 January 6th is “Old Christmas,” a tradition the Amish brought with them from 18th-century Europe. The Millers keep it as a family day, with visiting and feasting much like that on Christmas Day, but no gifts are exchanged. Amish businesses are closed on this day. “We just enjoy a day at home,” Mary says. Making the switch to the Gregorian calendar must have been interesting. You would go to sleep one day and wake up “ten days later”. Calendar reform was implemented at different times in different countries in the centuries following the Pope’s decree. Four countries implemented the change on the intended date. In Spain, Italy, Portugal, and the Polish-Lithuanian Commonwealth, October 4, 1582 was followed by October 15, 1582. As the years went on, time due to the miscalculation in the previous Julian calendar accumulated. This meant countries who adopted it later had to make a change of more days. When Britain (and the American colonies) adopted the calendar in 1752, it was necessary to add 11 days. In Russia, the change was not implemented until 1918. At that point, a shift of 13 days was required to correct the discrepancy. Others implemented the new calendar in odd ways. Sweden gradually shifted into the new calendar over a period of 50 years, which included adding an unusual February 30th in the year 1712. Greece was the final Eastern Orthodox European country to get with the program, with February 15, 1923 followed by March 1, 1923. Read more on general Amish observance of holidays, and 5 lesser-known holidays celebrated by Amish. Thanks Erik!! This is a piece of history I don’t recall knowing anything about. I found it quite interesting. I would think it would have been very difficult to adjust to that drastic a change. “Old Christmas” was celebrated on January 5 (not 6) by the residents of Rodanthe on the Outer Banks of North Carolina, especially when they were more isolated than they are today (before they were connected by a bridge to the mainland). Part of their tradition is “Old Buck,” a four-footed, bull-like creature that is supposed to live in the forest during the rest of the year but appears at the Christmas party to dance and frolic. Some countries waited so long to adopt the Gregorian calendar because a Roman Catholic pope, Gregory XIII, had instituted it. Catholic countries adopted it, but Orthodox and Protestant countries refused until it had become the European standard. Coincidentally there are other traditions associated with January 6 that pre-date the switch from the Julian to the Gregorian calendar. For most western liturgical churches, January 6 is the Feast of the Epiphany, which brings to a close the season of Christmastide (the “Twelve Days of Christmas”). Traditionally, the day has been associated in the West with the visit of the Magi (Wise Men) and in the East with the baptism of Jesus by John the Baptist (the Feast of the Theophany). Both events constituted “epiphanies”: revelations of Jesus to the world. Because Epiphany was associated with the gifts of the Magi, it was also for some the day of gift-giving, or for others the end of the Christmas gift-giving season (“On the twelfth day of Christmas, my true love gave to me …”). The night of Epiphany, or Twelfth Night, has long been associated with partying. A service of Holy Communion is celebrated on 6 January (Epiphany) each year in the Chapel Royal, St James’s Palace, when an offering of gold, frankincense and myrrh is made on behalf of The Queen. These are the gifts offered, according to tradition, by the Magi to the infant Jesus. This service has its origins in royal ceremonies which date back to the Norman Conquest. According to Psalm 72, the Wise Men were three kings, so it was fitting that an earthly king should make an offering at Epiphany. It became a crown-wearing day in the 15th century, and the Sovereign always attended the ceremony in person. George II, upset at the death of his daughter Princess Caroline, whose funeral took place on the eve of Epiphany in 1758, deputed his Lord Chamberlain to make the offerings. Nowadays, the offerings are made by two Gentlemen Ushers to The Queen, wearing service dress, who are escorted to the Royal Closet of the Chapel Royal by a detachment of The Queen’s Body Guard of the Yeomen of the Guard. Forget Old Christmas, it’s Women’s Christmas in Ireland. Wow Damon!! Very interesting!! Lots of good info on the blog today!! In the particularly conservative Amish group I spent time with, the Dec 25th Christmas was a holiday where you visited family, friends, the sick and bed-ridden. Epiphany was a holy day of special importance where you stayed home with your family and spent the day with the Bible. I do not remember if it was also a fast day. I will second the ditto on Alice’s comment. Thanks for the background Damon! Lucy, I was not aware there was a Woman’s Christmas? Lance that is interesting. What group were you with if I can ask? Old Christmas is not celebrated at all in some places. As I understand it is not observed in Lancaster Co. Though it would be in some Midwest communities, like Holmes Co.
Yeah, but besides from my mom, I don’t hear any thing about ” old Christmas”. I mean, there is no “war on old Christmas” or anything [no presents either].It’s just another day for most people. Merry old Christmas! I wasnt aware of a Woman’s Christmas either but I like the sound of it! Thanks for the info Erik! In my family it is laughingly called “Skook’ur’ainian Christmas”, Skook’ur’rainian being, I presume, a bastardization of the word Ukrainian (one of my many heritages). In my family we occasionally enjoy perogies, or cabbage rolls and kielbasa at dinner (sometimes all three items). My family doesn’t take the observation of January 6/7 terribly seriously. But I have been told that, by more Orthodox Catholics, Christmas Eve is more important. Mom was a first generation Pole from NY – so we had Golumpki and Pierogies and red cabbage ever Christmas eve. We even had duck blood soup while my Babcia was alive. It’s an acquired taste to some, but comfort food to the children who have Polish heritage. I am surprised at this new term I’ve been seeing. I have been Catholic all my life, worked for the Diocese, known Bishops and even Cardinals and even performed for Pope JP II. I have NEVER heard of the term “Orthodox Catholic” without it referring to the Eastern Church — until 2015, when someone identified as that in conversation and I couldn’t get an answer as to how they are different. This has sprung up recently in the South, TX, OK, etc. And they are not any different from any Catholic in the Roman Catholic Church as far as I know. It’s a weird term that confuses me profoundly. If anyone out there is an “Orthodox Catholic” – please explain to me the difference between you and a regular Catholic. It is distressing not only to me – but to many Clergy I have been talking to. What is it? In my Episcopal church, we celebrated Epiphany by having a Feast of Lights service. It is an older service that not many churches do anymore. The Biblical story is read (in short form) from Genesis up to the Crucifixion and carols are sung. Every time a name of a Biblical person is said in the story, a candle on the altar is lit. At the end when we get to the story about sending the Light into the world, we in the congregation pass the light to each other as we light our own candles. It’s very beautiful and relaxing. All you have to do is sit and listen to the Scriptures. And, as my priest says, if you haven’t gotten Christmas music out of your system, tonight’s the night! Afterward, we gather up the greens that have been decorating the church since Advent and take them out and burn them. Then everyone comes in for some fellowship and King’s cake. Shom, love your family’s name. And I know pierogi and cabbage rolls well. There is an art to getting them right. Christina, sounds like a wonderful service. Erik. Pierogies (however they’re spelled) and kielbasa are comfort foods to me, having grown up on them. People say macaroni and cheese is a comfort food, or fried chicken, but not to me. I’m quite satisfied to eat a leftover piece of a coil of kielbasa like it where a meaty smelly ice cream cone. Beautiful, oh, deborgah (I don’t know how to spell it, but supposedly it means “Praise God” in Ukrianian. I have fond memories of my father and his mother working on a makeshift production line style set up in our kitchen to make them. Same deal for cabbage rolls. …My father and granny making pierogies I mean…. Jan. 6 ends a month of celebrating at our home. We start the season with Krampusnacht/St. Nick’s Day and go through Christmas, until we get to Old Christmas/Bufana’s Day. I grew up in a Presbyterian Church, and we would have a short Epiphany service, and then we would burn the Christmon tree and greenery in the church with paper bags filled with frankincense and myrrh. It always attracted a lot of attention since the church was down town. We had some amish friends from Indiana come for a visit the week after Christmas.And they Celebrate this day Old Christmas they were having friends and family over at their house. we had a wonderful visit and time together and many laughs with all ten of them now it is our turn to go and visit them. Interesting to learn of Old Christmas and Women’s Christmas. I love this blog and all I am learning through it. Damon, thanks for the history lesson! Would love more information where the Scot-Irish people are in Tenn. as this is what my husband’s heritage is. Especially interesting in the case of St. Teresa of Avila, who happened to die on the day before the switch, so her saint day was the next day, which was 10 days later. It was an irony that on January 6th (last Friday as I write this) was the day a friend and I decided to go visit the Amish community of Shipshewana. Many of the stores were closed and there were very few (like maybe, three) buggies on the road. We were really confused why the town was so quiet until we heard about it being a holiday. Just our luck. We were kind of disappointed to have driven so far. Something you wouldn’t think to check. Thanks for the history lesson, Erik! I never heard of ‘old Christmas’. But Hutterites observe Epiphany on the 6th of January as well. It’s like a Sunday with the church services dedicated to the Wisemen. Very interesting reading! I have heard the terms Old Christmas, Second Christmas in my readings. My church, the Russian Orthodox church, celebrated Theophany today, which technically I guess is equivalent to Epiphany. If it is not in the Bible…why practice it. Thats how heretical traditions get started. Especially, when there is talk of receiving special blessings for feats like diving into and retrieving from the water a cross. Erik, thanks for bringing this thread back up on Facebook today. I enjoyed the history lesson as well as the many comments. When I grew up in Central and South America,our family celebrated on December 25, but we also celebrated with the local folks on January 6, which was called Dia de los Reyes, or Day of the Kings, marking the Wise Men’s giving of gifts to the baby Jesus. That was their day for giving gifts. I loved it, because my birthday was a week before Christmas, then Christmas, then Dia de los Reyes, so three gift occasions in three weeks (more or less)! post today that the Amish observe Epiphany on the actual date. Both families I will visit Sat. are Swartzentruber Amish and I will ask them how they observed Epiphany this week. Glad it maybe saved you a trip Al. I’ll be curious what you hear from your friends about the day.